Essie Maguire was born on May 26, 1916 in St. Cloud, Minnesota to Bert Andrysiak and Regina Walsh. Bert was of Polish descent and worked as a farm hand. Regina was of German/Irish descent and cared for their three daughters: Essie, Arlene and Goldie. Essie attended grade school and two years of high school in St. Cloud and then quit to get a job in a shoe store. The Great Depression was particularly hard on the Andrysiak family, however, as Bert lost his job as did Essie and Arlene, who was working at the time in a flour mill. With little other choice, Bert made the decision to move the family to Chicago in hopes of finding a job. Eventually he found work in a factory, and the Essie found a job at Marshall Field. Arlene found work at Western Electric, and Goldie remained at home with Regina. Essie made new friends at work, though she was shy, and was introduced at a Christmas party to a young man by the name of Gip Lester. 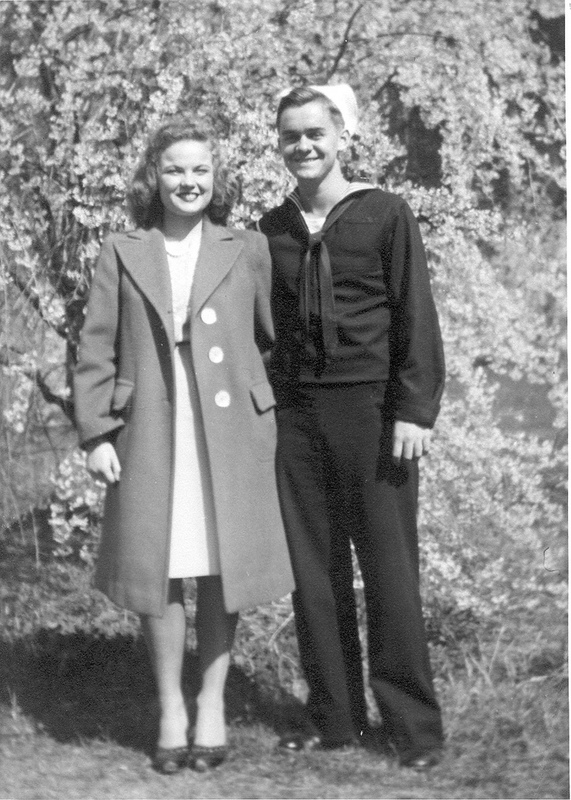 Essie and Gip began dating and fell in love, marrying nearly one year later on Thanksgiving Day. They went on a honeymoon to New York City, and Essie always loved to tell the story of seeing the big Christmas tree in Rockefeller Plaza. They lived for a time with Essie’s parents until they saved enough money to get a studio apartment on Wrightwood. Gip worked mainly as a carpenter in various factories. When the war broke out, Gip enlisted in the navy and was shipped to the South Pacific, where he was killed in action. Upon hearing the news, Essie went into a deep depression and quit her job. 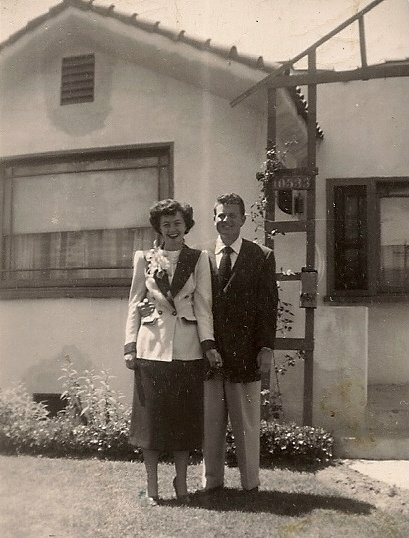 She remained at home with her mother (Bert had since passed away of lung cancer) and became almost a recluse. After a couple of years of this, Essie’s youngest sister, Goldie, urged her to go back out into the world and get a job. Essie finally took her advice and got a job as a waitress, which really brought her out of her shell by having to talk to so many people. One day in the early 1950’s, she waited on a man by the name of Michael Macguire, who was a cosmetics salesman for Revlon. He asked her out, and she hesitantly accepted, but only if she could bring along one of her sisters. Michael apparently laughed at this and said that of course she could bring her sister. Essie went home that night and persuaded Goldie to come with her on her date, as Arlene was already married and out of the house. So it was that Essie, Michael, and Goldie went bowling, and by the end of the night, Essie was smitten. Michael asked her out again, and this time she agreed to go alone. They went dancing at the Aragon, and then began seriously dating. After only a shocking three months, they got married in 1952, again on Thanksgiving Day, as Essie thought it would bring them good luck. Michael and Essie eventually moved to Indianapolis, and remained there until 1969, when Michael accepted a promotion at Revlon, which meant they had to move to California. In all, they had twenty-five good years together before Michael died in 1977. They never had any children. When Michael died, Essie again grieved and considered moving back to Chicago. She was reluctant, though, to leave the house she and Michael had built and the community of friends they had made. In the end, she decided to stay put, though whenever she talked to one of her sisters on the telephone, she would tell them she was going to come back. Finally, in 1992, Essie’s sister, Goldie, and her son, Jim, decided to travel from Chicago to visit Essie. During their stay, it became apparent to Jim that his aunt Essie, even though he barely knew her, was a bit confused and forgetful. He pointed this out to his mother, but she denied that there was any problem with her sister, saying that it was just old age setting in. A year later, however, Goldie got a call from some of Essie’s neighbors, who told her that people from the bank were at Essie’s house to foreclose on it, as apparently Essie had not paid the mortgage in months. Goldie put in a frantic call to Jim, who flew out to San Diego to try to solve the problem. Jim found all of Essie’s affairs to be in complete disarray, especially her finances. She was completely out of money and her check book record going back two years was unreadable. His aunt, he says, must have been an expert at “fooling people,” with no one, not even her neighbors, realizing the extent of her mental deterioration. Jim took her to a doctor where she was diagnosed with Alzheimer’s and dementia. During the doctor’s interview of her, Essie could not even state her current last name or even the season, much less the date. Jim brought Essie back to Chicago to live with his mother, thinking it would be nice for the two sisters to live together again and keep each other company. Shortly after Essie moved in, however, Goldie was diagnosed with cancer, which caused Essie to oddly become antagonistic toward her and even abusive at times. Jim had no choice, then, but to admit Essie to a nursing home. Goldie felt guilty about not being able to care for her sister, but Jim insisted, saying it was his fault for naively thinking it would be a good situation. Essie has made the transition to a nursing home very well. She is confused most of the time and wanders the halls, but is easily redirected. She seems pleasant, for the most part, and cooperative. Jim visits when he can, but he is currently preoccupied with caring for Goldie.